A misguided decision by a state judge in Texas, permitting public school cheerleaders to exhibit Christian bible verses and messages during high school football games, makes Christianity the official school religion in Kountze, Texas. So contends the Freedom From Religion Foundation, whose letter in September 2012 challenging the religious banners set off the legal controversy in the Kountze Independent School District. After receiving FFRF's letter, the district superintendent properly ordered cheerleaders to stop holding Christian prayer banners for football players to run through while entering the stadium. The cheerleaders, represented by a Religious Right law firm, then sued the school district. FFRF was not a party to the lawsuit, but filed an amicus brief in the case. FFRF would like to challenge the religious banners as part of official football games in federal court if students, faculty or parents subjected to such proselytizing come forward. FFRF called the decision by an elected local judge in a conservative state a foregone conclusion. The four-paragraph decision by Judge Steven Thomas, 356th Judicial District, does not cite a single case, law or constitutional precedent. "It's impossible to imagine a judge approving cheerleader messages saying, 'Atheists rule — God is dead' or 'Allah is supreme — pray to him for victory,' " said Annie Laurie Gaylor, FFRF co-president. 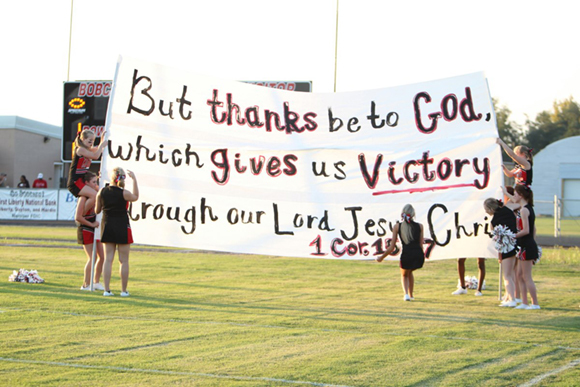 Typical Kountze banners read, "But thanks be to God, which gives us Victory, through our Lord Jesus Christ. 1 Cor. 15:57." "The high school in Kountze is not a Christian high school, Kountze is not a Christian city, Texas is not a Christian state and the United States is not a Christian nation," Gaylor added. "Proselytizing messages by cheerleaders representing the school, wearing the school uniform, at the official start of a public school football game, inevitably carry the appearance of school endorsement and favoritism, turning Christians into insiders and non-Christians and nonbelievers into outsiders. "It's not only a violation of the law, it's a violation of good manners," Gaylor said. "There was not even a bona fide case or controversy before the court concerning a violation under the Establishment Clause," commented FFRF Staff Attorney Patrick Elliott. "Both parties — the school district and the cheerleaders' attorneys — asked the court to issue an order allowing the display of Christian banners to continue. The lawsuit ought to have been dismissed because there was no case or controversy: both parties sought to display the religious banners." Under a new school board policy, and in briefs to the court, Kountze ISD made clear that the banners are under district control and are "government speech." The district also expressed that it would like to see the religious banners continue to be displayed. Both state Attorney General Greg Abbott and Gov. Rick Perry had inappropriately weighed in on the case. Abbott even called FFRF "menacing."